Did Brett Kavanaugh nail a dead pigeon to his gay roommate’s bedroom door? One of Brett Kavanaugh’s college roommates has come forward to talk about the Supreme Court nominee’s drinking problem, and also about a dead pigeon he found nailed to his door. Kit Winter was an out gay man at Yale University in the early 1980’s, the same time that Kavanaugh attended that school. 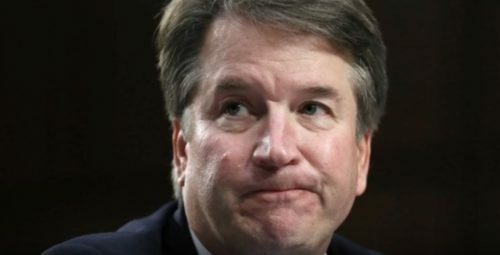 They lived together in a three-person suite, with Winter in a single room and Kavanaugh sharing a double room with James Roche. Roche has already talked to the media about how Kavanaugh was a “aggressive and belligerent” drunk, and several other people who knew Kavanaugh in high school and college have contradicted his claim that he never drank so much that he had a memory lapse. In an interview with The Cut, Winter describes an incident involving a dead pigeon that he found nailed to his door – the door to his room, not the outside door to the suite. Several of his friends at the time corroborated that a bird was nailed to the door, although no one knew who did it. “I remember that Kit was really unhappy with his roommates,” said Lori Adams, a retired psychiatrist who was Winter’s friend at Yale. Winter didn’t report the dead bird to the police and he didn’t ask to change rooms, since he had already asked the dean to move him into the empty single-person room in the suite. Winter also doesn’t buy Kavanaugh’s claim that he did not drink excessively. “Having witnessed the level of drunkenness of Brett and his crew in that dorm, and the vomitous aftermath in the bathroom, I find that very hard to believe,” that he never had memory lapses while drinking, Winter said.